Is perception reality? Editor Melanie Metzger investigates the cultural perceptions by and of deaf people around the world in volume six of the Sociolinguistics series Bilingualism and Identity in Deaf Communities. “All sociocultural groups offer possible solutions to the dilemma that a deaf child presents to the larger group,” write Claire Ramsey and Jose Antonio Noriega in their essay, “Ninos Milagrizados: Language Attitudes, Deaf Education, and Miracle Cures in Mexico.” In this case, Ramsey and Noriega analyze cultural attempts to “unify” deaf children with the rest of the community. Other contributors report similar phenomena in deaf communities in New Zealand, Nicaragua, and Spain, paying particular attention to how society’s view of deaf people affects how deaf people view themselves. 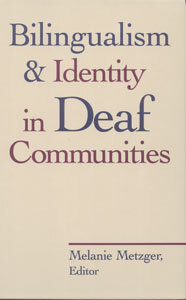 A second theme pervasive in this collection, akin to the questions of perception and identity, is the impact of bilingualism in deaf communities. Peter C. Hauser offers a study of an American child proficient in both ASL and Cued English while Annica Detthow analyzes “transliteration” between Spoken Swedish and Swedish Sign Language. Like its predecessors, this sixth volume of the Sociolinguistics series distinguishes itself by the depth and diversity of its research, making it a welcome addition to any scholar’s library. Melanie Metzger is a professor and chair of the Department of Interpretation at Gallaudet University.